So back in November or December I got a message one morning that I needed to give a wild cave permit to a film crew. I knew that they had been attempting an ascent of Wheeler Peak, but didn't know anything else. When they came to my office, they introduced themselves as Jack Seward and Colton Smith from Rock the Park. I gave them a map of the cave, the key, and instructions about how to proceed. I told them that Little Muddy Cave was about 600 feet long and was a mazy cave with a lot of crawling passages. Before they entered the cave, they would need to go through the concrete block behind the visitor center to make sure they wouldn't get stuck in the tight spot. They had to have at least three people go into the cave for safety. They needed to wear a helmet, headlamp, kneepads, and elbowpads. And if they were willing, I'd like them to install three temperature and humidity dataloggers as part of a climate change project. They listened to all this with their production crew, and then asked if I would be willing to be on camera and repeat it all. I shrugged. I didn't have a park uniform on or time to go home and put one on. They put a microphone on me and we planned to meet at the parking area after the guys went through the block. I figured it would take them a little time to do that, so wisely brought some reading material. They showed up, and it was a really windy day, so we went to the cave entrance to try and film there. I gave them the key and stumbled through the introduction to the cave. I'm not too smooth on camera! They made a production of gearing up with the kneepads and elbowpads. Then they opened the cave gate and clearly didn't like what they saw. I wasn't sure if they were going to go through with it. But they did. In the clip below, you can see some behind-the-scenes action from the photographer's point of view. 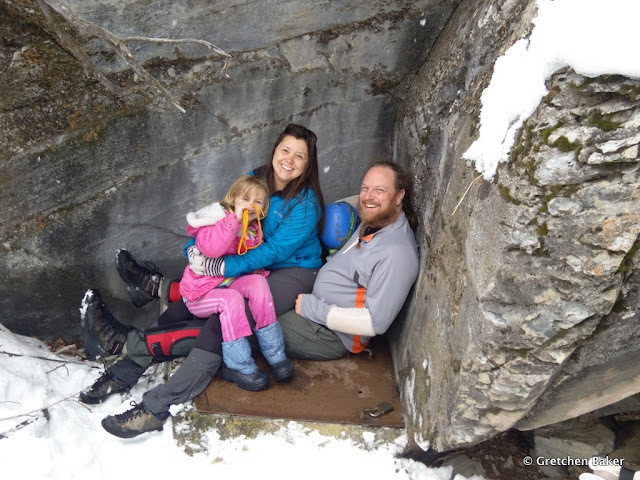 A month or two later I went back to Little Muddy Cave with some friends and my kids. Here they are waiting for me on the gate. You open the gate and climb down a short ladder and then immediately are on your belly for about thirty feet. Eventually you get to places where you can stand up--if you're a kid! The cave wasn't at all muddy because it just isn't in winter. But you can see by some of the muddy marks on the walls that the cave has been muddy. Near the back of the cave there's a challenge chute, where you squeeze down a narrow passage head first. I went and then challenged Desert Boy. He liked it. You know if it's a squeeze for him, it's small! I can't wait to see how Jack and Colton's trip into Little Muddy Cave went, along with the rest of their adventures at Great Basin National Park. The Rock the Park episode is playing on ABC Saturday morning, April 16 (times vary). It looks like you can also see it a day or two later on Hulu, and they will probably have a link up on their Facebook page. If you see it, let me know what you think! p.s. After I met them, I went home and looked up Rock the Park and started watching it with my family. Season one is available on Netflix. It's fun to see so many different national parks!